The two main technologies underlying Scrapbook101 are how data is stored using a NoSQL data storage approach and how we present and interact with the data in a browser using a Model-view-controller (MVC) software pattern. We discuss these two technologies here along with a quick introduction to geocoding as used in Scrapbook101. NoSQL is a broad term that refers to storage and retrieval of data that is not modeled in a relational way, that is, with columns and rows where each row is uniquely identified by it’s own key. It’s helpful to think about NoSQL databases as providing solutions for classes of problems that require more flexibility for storing data, be it a document store to store documents, a graph database to represent relationships, or a key/value store for accessing essential information in a simplified way. These classes of problems arose with the surge in social networking and big data applications, and are examples where relational databases can’t adequately address the problem, in particular, performing at scales required by these new classes of problems. We can also say that NoSQL data storage solutions do not have a fixed schemas but intead have flexible schemas. What does flexible mean? It means a schema - at least as we are interpreting for Scrapbook101 - that is defined outside of the database and is easier for application developers to work with and change. How is it easier for application developer? Here, we show just one simple example of how by defining our “prototype” document schema in JSON and then creating a programming class representation of that. In this way, processing of the data in the database and changes to the schema are more developer-centric. For more background reading on schemas and relational versus NoSQL databases, see NoSQL Database Doesn’t Mean No Schema. Microsoft Azure Cosmos DB is a multi-modeled database service that supports NoSQL databases called document-oriented data stores, which is what Scrapbook101 uses. In document-oriented data stores, data is stored in documents where each document can differ slightly (if needed) in its schema while remaining part of a larger database collection. Documents are roughly equivalent to an object be it represented in code or JSON. The two documents share common fields like id, title, description, and rating and differ on other fields that are specific to the category of the item. The Scrapbook101 schema is a bit more complex than the book and film example above, but the idea is essentially the same. With Cosmos DB, you have the usual CRUD (create, read, update, delete) operations on the documents in the data store. And you can use SQL-like query language to query the document store. For example, in the local emulator you can create a query to search for documents. The following image shows a query that finds items with a rating greater than 3. In the Scrapbook101 code, similar queries are constructed using Language Integrated Queries (LINQ). The Scrapbook101 code was initially built starting with the ASP.NET MVC To-Do List app and customizing it. From that version, the ASP.NET core version was created. While Scrapbook101 is more complex, that is, more pieces of information are tracked and document JSON structure can change as shown in the book/film example above, the idea is essentially the same as the To-Do list. The second technology that underlies Scrapbook101 is the Model-view-controller (MVC) software pattern. This pattern is commonly used to divide an application into functional pieces. Doing so has the advantages of better code reuse, parallel development, and ease of modification. The main challenge many encounter with MVC is that there is an initial learning curve getting used to thinking in terms of the three components (model, view, and controller) and understanding how they communicate. Scrapbook101 is built around the MVC pattern as supported by the .NET Framework as well as .NET Core. The ASP.NET MVC Visual Studio project file is here and the ASP.NET Core Visual Studio project file is here. For more on the difference between the .NET Framework and .NET Core, see The Difference Between .NET Framework and .NET Core. 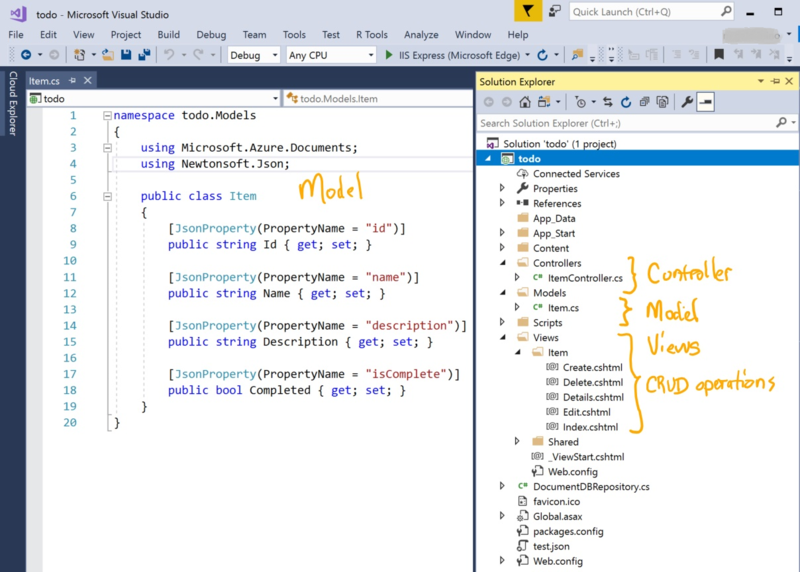 Taking the To-Do list application and looking at it in Visual Studio gives a good idea of working with MVC in ASP.NET. In this example, note the representation of the JSON notation of an item in C# code. Scrapbook101 can be used with Bing Maps geocoding. Geocoding is the process of converting an address presented as a string (“Seattle, WA, USA”) into a location on Earth represented by geographical coordinates (latitude and longitude). Each Scrapbook101 item has an associated location that contains a string value such as “Seattle, WA, USA” or “Italy”. If you set the bingMapKey key in the web.config file to a valid key, then geocoding is enabled and addition to the location, a geoLocation value is calculated that contains the geographical coordinates corresponding to the string value. If The bingMapKey key is blank, which it is by default, no geocoding is performed. Why is geocoding important? With the intuitive nature of searching for information with a map and the integration of maps in many aspects of our lives, it is important to associated Scrapbook101 items with geocodes that are universal and independent of string names. A good analogy is in botany when referring to a plant. The most accurate way to refer to a plant is by its scientific name rather than its common name, which depends on location and language. The latitude (47.6035690307617) and longitude (-122.329452514648) are what would be stored with the Scrapbook101 item geoLocation field in the item document.